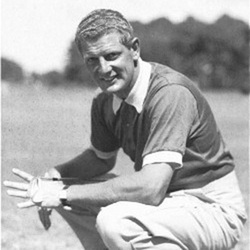 Before graduating from the University of Miami in 1949, Al Besselink twice won the prestigious Southern Invitational Championship. In doing so, he became the first UM golfer to win a national tournament. Following graduation, Besselink played for 20 years on the Worldwide Professional Tour. He later played an instrumental role in the founding of the Senior PGA Tour. Among the professional tournaments at which Besselink won titles were the 1953 Sioux City (IA) Open, 1953 Tournament of Champions, 1956 Azalea Open, 1957 Kansas City Open, the Palm Beach Open and the Havana Open. In tournaments abroad, Besselink claimed titles at the Venezuela Open three times, South American Open in Bogota, Columbia, the Baron Cay Open in Venezuela and the Madrid Open in Spain. As a PGA golfer, Besselink played in the Masters Open at Augusta National in 1952, 1953 and 1954. He placed in the top 10 each of those three seasons with a high of No. 3 in 1953. Additionally, Besselink played in the U.S. Open in 1951 (10th place) and 1953 (3rd place). Among his most storied championships was winning the 1954 Mixed World Championship of Golf with legendary female golfer Babe Didrikson Zaharias. In October 2010, he was honored as a Miami Sports Founder by the Greater Miami Chamber of Commerce.